Advantages: High standard of models, clear description of tips and techniques, excellent photo coverage of subjects. Osprey's "Modelling the German 15cm sIG33 Bison and Grille"
The 15cm sIG33 was a tough and reliable weapon that served the infantry well. It was on the heavy side and therefore not easy to maneuver so mounting it on its own self propelled chassis seemed like an ideal solution. This would then provide more immediate fire support to the infantry. 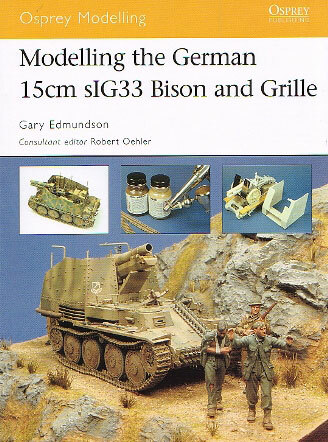 This book in Osprey’s Modelling series, gives Gary Edmundson a platform to show how to build five of these variants in 1/35th scale. A brief introduction describes the vehicles to be attempted and this is followed by a section on the types of tools and materials required to undertake the task. The varied complexity of the subjects chosen mean that there is something for all skill levels. The first vehicle is the Sturminfanteriegeschütz 33B. Given an intermediate skill level, this project makes use of the Dragon kit with aftermarket etched screens and workable tracks. As with each of the articles, the modeller need only go as far as their skill level or finances allows. The author merely illustrates one path that can be taken to enhance the base kit used. There are plenty of interesting modelling methods employed and the reader can learn a lot from these alone. Various techniques are explained and this is done in a clear and concise manner. As with all the chapters, there are plenty of construction photos. These help the reader see what has happened along the construction path before it is all covered in a coat or two of paint. Speaking of which, this aspect of modelling is not forgotten, and there is much pertaining to the painting and weathering of the topics under discussion. The sIG33 (sf) auf Panzerkampfwagen I Ausf. B is the next subject tackled. Due to the number of items used in the modification, the skill level is advanced. 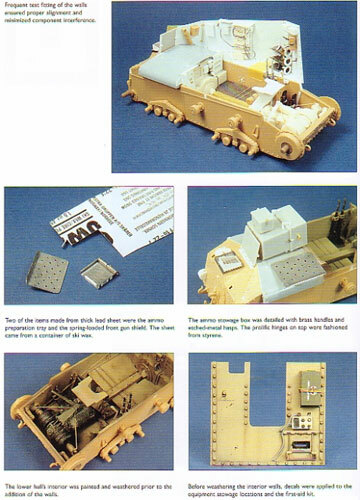 The New Connection conversion set is mated with Italeri’s Panzerjäger I and additional details are added with etched metal. Tiger Model Designs make a sIG33 and this was used to replace Alan Hobby’s rendition. For those that want to learn more about how to go about scratch building, the next example is for you. This involves correcting the Kirin Sd.Kfz. 138/1 Ausf. H “Grille”. Much has been written before about this kit’s shortcomings so it will come as no surprise that Tamiya’s Marder III was used as a basis. Tiger Model Designs, CMK, Eduard, ModelKasten and Aber all contribute to help make things right. The final two subjects are easier to construct and are based on the Alan Hobby kits of the “Bison II” and “Grille M” (later research indicates the latter was the Grille K). These involve minimal or basic scratch building and the finished items are placed in effective dioramas. The author explains how this is done as well, with the usual “in progress” pictures and detailed explanation. A simple desert setting is considered first, followed by a more complicated rocky cliff face locale. The book finishes with a section on the available kits and accessories, including those in the smaller scales. Another appendix deals with surviving museum examples and a list of websites, books and magazines for further reading. Also included is a printed colour chart that describes the different base and camouflage colours used by these vehicles. The book is not meant to persuade the reader to go out and purchase all the items seen to build the subject of a particular chapter. Many are used to provide that extra bit of accuracy but are not essential for the average builder. It is supposed to give inspiration for the modeller to try something that they would normally shun away from. The accomplished work of Gary Edmundson should do just that.